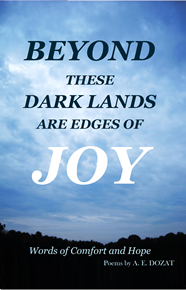 PATIENCE, A Poem of Him Who Watches, is found on page 13 of my Book, Beyond These Dark Lands Are Edges of Joy, Words of Comfort and Hope. I wrote this poem as encouragement for those who feel that they are going through a long time of hardship. The title is two-sided. At first, it could be that we are going through the dark time and must be patient, but, the subtitle, A Poem of Him Who Watches, might be about how God watches over us through our long night, or that we are watching for deliverance through the night. This open-ended title starts the reader thinking right from the beginning. 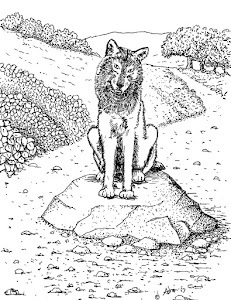 The poem is 26 lines long with grouped rhythms to speed up or slow down the reader. The first nine lines are the opening statement. Lines 1-6 are all short and move quickly, followed by two lines of both five syllables then line 9 is six syllables. The opening combines not only place and time but also experience. A Poem of Him Who Watches. Lines 20 through 22 talks about the comfort of faith that is based on truth. The poem concludes in lines 23 through 26 by declaring that our patient faith proves our love for God. The metaphor of the stars makes us face eternity with a sense of our smallness and ignorance of what is beyond our place and time. But faith hopes for the dawn and watches in that hope because we know our patient waiting is evidence of our faith in God who is also watching over us. 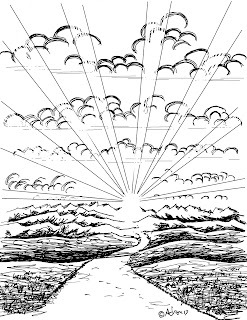 The poem is illustrated with a pen drawing of a road leading to the sunrise. Our lives are a living statement. How we react to suffering speaks to others. This poem helps people see that their reaction to trials must come from a mature thought-out faith. It shows the purpose of enduring through hardship. There are many reasons and explanations for our suffering and no one answer suffices for all, but this poem says that our enduring faith in God during hardships proves our love for God. “However, as it is written: ‘What no eye has seen, what no ear has heard, and what no human mind has conceived’ -- the things God has prepared for those who love Him.” 1 Corinthians 2:9, NIV. This poem like all the poems in this collection gives comfort and hope. For digital downloads (pdf) CLICK HERE, $2.99.